Vermont’s rivers and streams do not freeze solid, even during the coldest winter nights, and areas of fast-moving water like the falls in Middlebury remain open all year. However, the amount of water in rivers may drop dramatically in the winter, because aboveground sources of water freeze and only seeps and springs continue to flow. 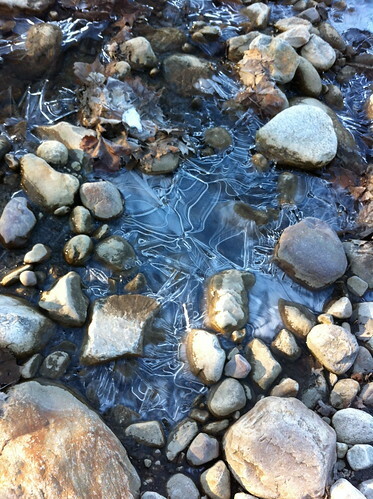 The ice formations here were created when ice started forming along the Middlebury River, and the water level dropped, leaving large crystals and layers of ice exposed to the air. More pictures of ice formations are available on my Flickr account here, and I’ll upload additional photos as cold conditions continue. Today is rather warm by December standards, with scattered rain showers forecast throughout the day. However, by this weekend, we may experience something we haven't seen in a while - below average temperatures, with even the high temperatures staying below freezing. 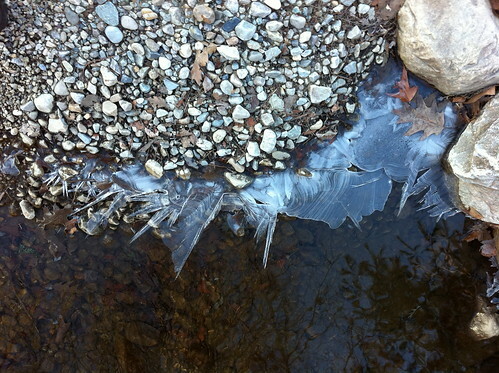 Today's rain will probably raise the level of the river a bit, and it will drop right back down this weekend, creating more beautiful ice formations. 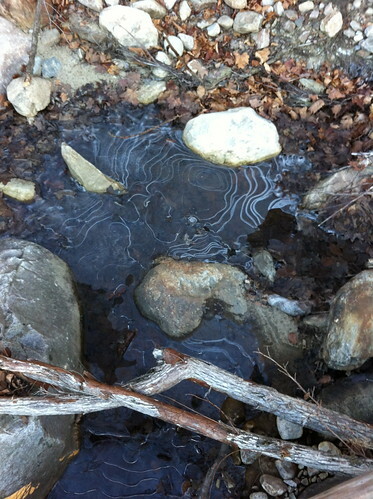 I suspect that the same will happen along any fast-moving river or stream in the area. One VERY important thing to keep in mind: the unusually warm conditions of the last few months have led to much thinner than usual ice on the local rivers and lakes. 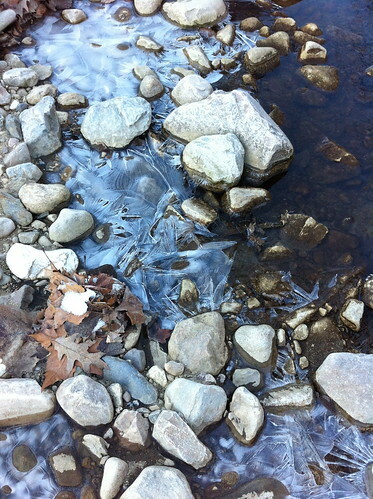 Enjoy the ice formations along our waterways, but do NOT attempt to walk or skate on the ice. If you are in the mood for ice skating, please enjoy a manmade ice skating rink and save the outdoor ice skating, ice fishing, and wetland exploration until after the ice is much, much thicker. Charlie Hohn is a recent graduate of the UVM Field Naturalist graduate program. He has been closely watching the weather ever since he was a child in southern California. Charlie will be posting occasional blog posts here about Addison County weather. He also maintains a blog about water at slowwatermovement.blogspot.com.